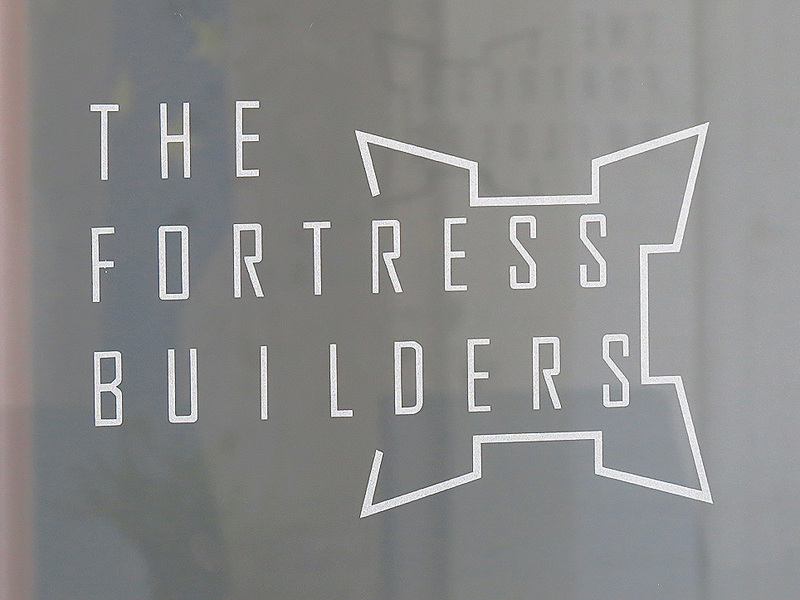 The Fortress Builders (or The Fortress Builders Fortifications Interpretation Centre to give it its full name) is one of the latest of a string of innovative cultural interpretation centres to be set up in Valletta. Inaugurated in 2013, the centre is a public institution dedicated to the understanding and appreciation of Malta’s rich military history. Set on three floors, the centre is appropriately housed in fortified 16th century stores located at the Marsamxett Harbour end of Saint Mark’s Street and which form an integral part of Valletta’s defences. The impressive thickness of the building’s walls is in fact one of the first things any visitor cannot fail to notice. 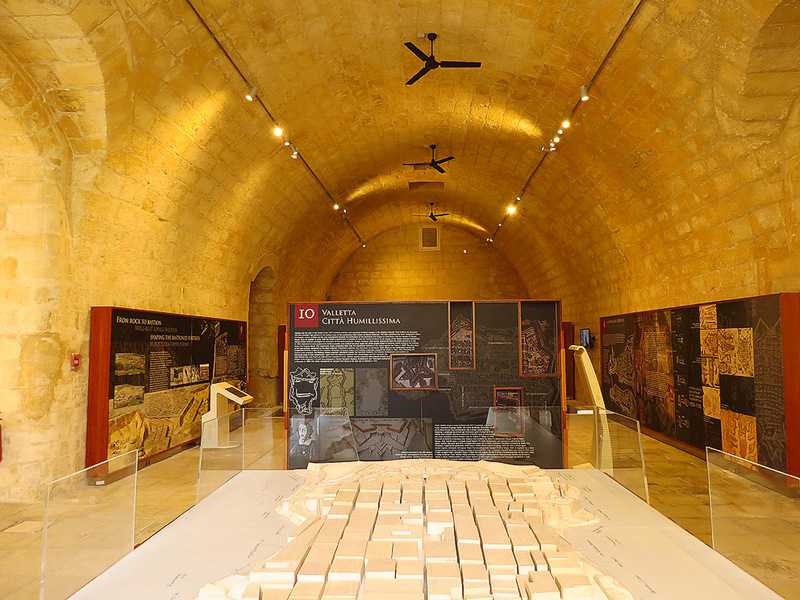 The FIC’s ground floor is dedicated to an overview of defensive warfare in world history and there is also an extensive display of tools used in building Malta’s impressive bastions. 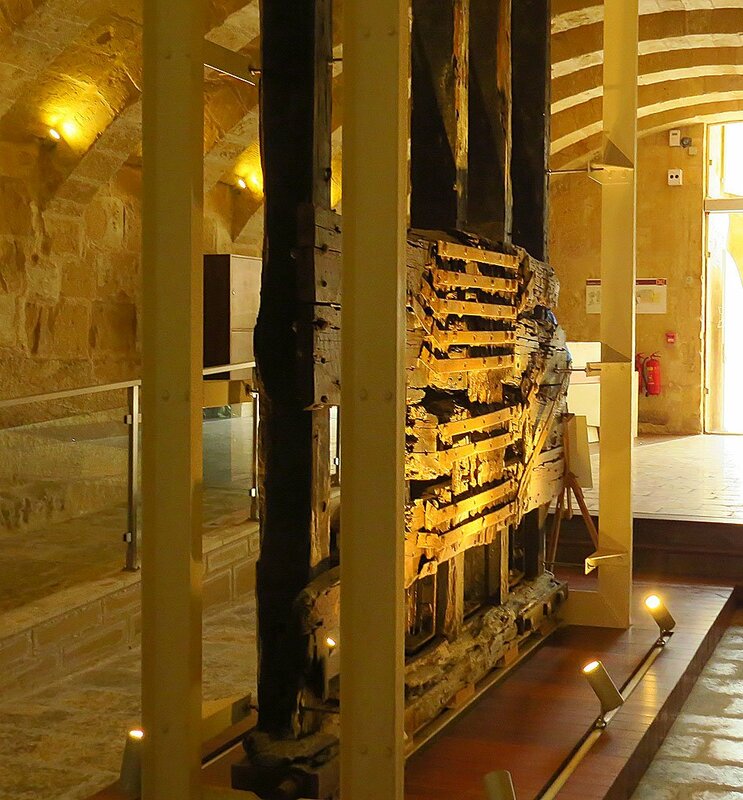 Here too one finds one of the Centre’s more impressive displays – the wooden framework of an old drawbridge believed to have been in use on Valletta’s main gate in the 16th century. A scale model showing how the lifting mechanism worked is also on display nearby. The first floor encompasses the history of fortifications in the islands from the earliest times up to the late eighteenth century. Although fortification does not seem to have formed part of the Neolithic temple builders culture, all that changed when that particular civilisation collapsed and was replaced by what appear to have been warlike Bronze Age people. Malta’s oldest fortification does in fact go back to the Bronze Age – with an impressive defensive wall that still stands at Borg in-Nadur in Birzebbuga. A model of the wall is housed in the Centre. The highlight on this floor is of course the Knights’ legacy of defensive architecture – the Maltese islands have no less than 60 kilometres of ramparts (impressive in a country measuring 316 sq kilometres!) as well as a wealth of fortresses and defensive towers spread across the archipelago. 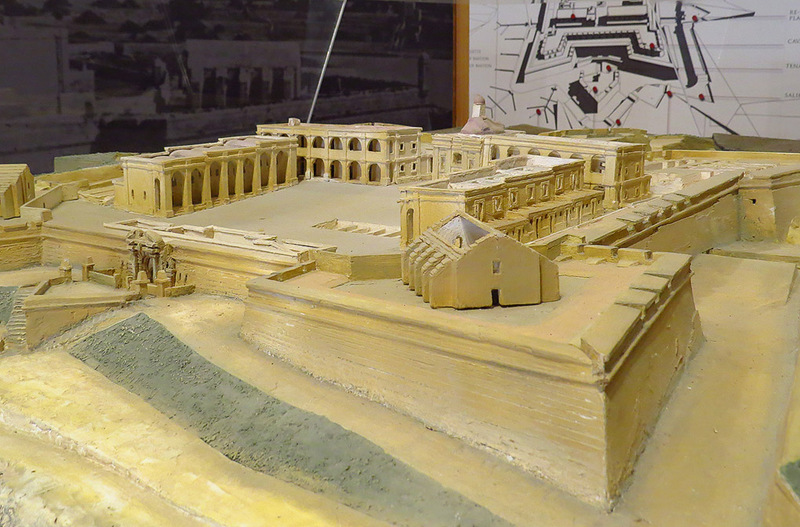 Also noteworthy here are full scale models of the ancient Roman town of Melita (today’s Mdina and Rabat), the Gozo Citadel, Valletta itself, Fort Manoel and Fort Tigne – this last the Knights’ last major fortification in Malta and displaying a significantly different defensive style to what came before it. The FIC’s uppermost floor is dedicated to 19th and 20th century defensive architecture – in Malta corresponding to Britain’s rule over the Islands until their Independence in 1964. The British style of defensive architecture is markedly different from the Knights’ efforts. Whereas the Knights built high (and obviously very visible) walls and bastions, by the time the British came to Malta military defence theory had evolved to produce low-slung, partially hidden fortresses – less impressive to view perhaps but equally effective in their day. Later on the emphasis was on smaller (and more widespread) batteries and gun posts – and camouflage also entered the equation when military aircraft started taking to the skies. Here again a wealth of scale models and interpretation boards help in the understanding of this rich historical legacy. The FIC is an essential stop for anyone interested in military history and will enhance anyone’s experience of this essential element of Malta’s chequered history. Entrance to the Centre is free of charge. Mon, Wed, Fri 9.00 am- 1pm. Tue and Thu 9.00am – 4pm. Sat 9.30am – 1pm. Mon, Wed, Fri 10.00 am- 4pm. Tue and Thu 10.00am – 7pm. Sat 9.30am – 1pm. The Centre is closed on Sundays and public holidays. On the 24th and 31st December the Centre is open till 12.30pm.